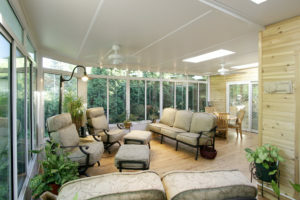 Porch Outfitters is proud to install top-quality sunrooms for homeowners in Springfield, Georgia, and all of the surrounding communities. We only install top-of-the-line sunroom products from the trusted manufacturer TEMO to ensure our customers receive the best value for their investment. A TEMO sunroom is superior to the alternatives because it is meticulously engineered from the finest materials and will stand strong even after decades of harsh UV exposure and inclement weather. These sunrooms also feature TEMKOR surfacing, an innovative cladding material that is resistant to impacts, UV rays, dents, and scratches, to achieve long-lasting beauty. Have been serving homeowners throughout the region since 1987, making us one of the most experienced companies in the area. Have earned numerous accolades in recognition of our excellence, including an A+ rating with the Better Business Bureau and a Best of Ridgeland Award by the U.S. Commerce Association for Best Sunroom Contractor. Use our own team of factory-trained employees – not subcontractors – to install our sunrooms, so each project is completed in accordance with our high quality standards. If you’d like more information about the sunrooms we install for homeowners in Springfield, GA, contact Porch Outfitters today. We’ll be happy to discuss your needs as well as the financing options we have available to homeowners who qualify.